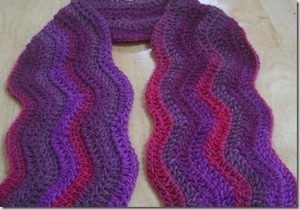 This is a very quick and easy crochet pattern for a wavy rippled scarf. The sample shown here is worked in Wendy Fusion shade – Piri Piri. It is 54 inches long and used two 50g balls of yarn and a 6mm hook. The basic wave pattern is based on multiples of 14 so begin with desired length in a multiple of 14. For U.S. crochet instructions change tr to dc and dtr to trc. Chain 140 + 3 for turning. Repeat between ** ending last rep with 2 tr into last ch, turn. This pattern is offered and made available for personal use only; by Aileen of the former Goodtimesithinkso blog.